One of the key aspects of manufacturing is to create a solid production plan, in order to manage all processes efficiently and simply. By achieving this, manufacturers should be lean with the aim, to maximise productivity, limit waste, create quality goods and most importantly, satisfy customers. Yet, this does not come without a great deal of organisation as there is a wide range of factors to consider within production planning. Before you put the plan into place, some preparation will need to be thought out. One of the key factors would be having a good inventory management system or processes in place so production planners will know exactly what resources are available at any given time. Another would be to assess previous sales data and forecast the likely sales figure to estimate the number of products that should be manufactured. By doing this, the business should therefore not lose out on unnecessary labour, incur higher manufacturing costs and avoid excessive production. This is especially important for businesses who rely solely on manufacturing custom orders, due to the fact that each one is individual, looking back on historic sales can also provide some indicator of future trends. By ensuring that your production plan is reasonable with time, schedules should be thought out. Whilst schedules should be rather full, there should also be space to cater for issues, should any arise to avoid issues escalating later on down the line. Inventory: Do you have the relevant materials in stock to carry out orders? Also, do you have too much stock which could become outdated or no longer required? Human resources: Do you have enough staff to carry out production? 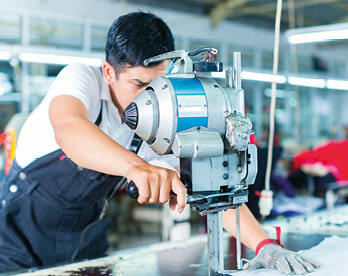 Machinery: Do you have enough machinery available and the capacity to finish the products by a certain time? Comprehensive ERP systems can remove the need for standalone manufacturing software and can reduce the stresses of your production scheduling. ERP systems have built-in features which can alert businesses on how much stock is present to avoid buying in excessive amounts and makes for lean operations. It may also show within the system the availability of machinery and workforce. ERP software can assist the creation of production timetables, which resolves issues with timings. By investing in it, you can be certain it will help improve efficiency and assist you in planning. Should any changes to orders arise, changing your production plan can be difficult and may take even more time than starting with a plan initially. ERP systems can help you manage changes with little hassle.